✅ HEALTHY AND NUTRITIOUS - High in Protein and Low in Fat, 123 Treats Lamb Ear dog chew is packed with essential Vitamins and Nutrients for your dog to have a healthy diet. ✅ GREAT FOR ORAL CARE - Helps promote healthy chewing habits along with better oral health care. Helps remove tartar and plaque from your dog's teeth. ✅ SINGLE INGREDIENT, ALL NATURAL AND DELICIOUS - 100% All Natural Single-Ingredient Dog Chew. 123 Treats Lamb Ear Dog chews are completely free from additives, chemicals and artificial ingredients. ✅ EASY TO DIGEST - Picky eaters would appreciate a good Lamb Ear treat chew. It is easy to digest and are especially great for sensitive stomachs. 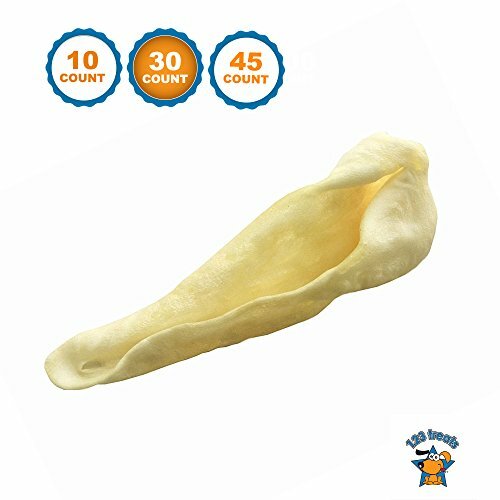 ✅ PERFECT FOR ALL SIZE DOGS - 123 Treats Lamb Ear dog chew is great as a training reward for your dog. From puppies to senior dogs, our Lamb Ears dog chew makes a great daily snack treat chew.